I’m walking through our local farm/produce shop on Saturday and we pass by a table with large buckets full of ripe bananas marked $1 each. Sometimes I’m too frugal for my own good, but I couldn’t resist the bargain which led to a morning full of banana baking on Sunday. Here’s the full details of my banana baking extravaganza. I started with a basic banana bread recipe. I used this for some regular sized muffins and later for some chocolate chip mini muffins. I left out the nuts, and used 1/2 cup of chocolate chips for the mini muffins. I had an assistant in the kitchen. He probably made a bigger mess than he contributed, but we both had fun in the process. I had some sour cream, so I ran across a recipe for Banana Sour Cream Bread and thought, why not! I didn’t have a full thing of sour cream, so I subbed in some plain lowfat yogurt. I made mini muffins, regular muffins & one loaf of bread from this recipe. I made banana waffles the last time I had some ripe bananas and they went over great with the boys, so I tried a different version. 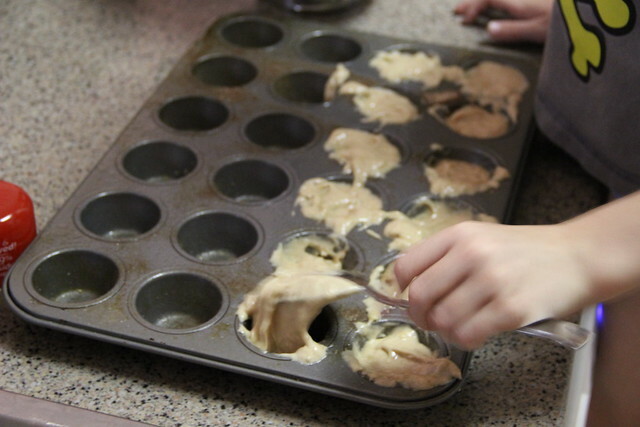 The problem with my previous batch was that they were too soggy. I tried a new (to me) recipe this time, but made some pretty significant changes based on what I had on hand. I doubled the recipe, put in applesauce instead of butter because I was running low, left out the sugar, added two tablespoons of flax seed and 1/2 cup of chocolate chips. The goal with the chocolate chips was to add some sweetness without having to use syrup. They aren’t sweet enough for my taste, if I don’t get a bite without chocolate chips, so I’d probably add the sugar next time. However, the boys still love them. I ended up with 4 bananas left and couldn’t bring myself to bake one more thing, so I put them in the freezer for smoothies. 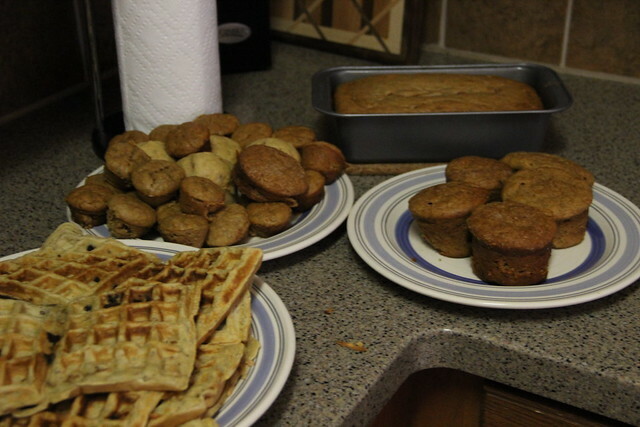 After everything cooled, I froze a bunch of muffins and waffles for later use. Previous to my banana bushel purchase, I had planned on making some brownies. I happened to have an unopened container of nutella in the pantry, so I found a nutella brownie recipe. I added peanut butter m&m’s to the top before baking, and cut them out with heart cookie cutters after they cooled. Cutting them out with cookie cutters meant I got to eat all the edges. It was a tough job but someone had to do it. 😉 C2 helped me by licking the nutella spoon. You are making yummy food and good memories!